Since the soleus comprises slow-twitch muscle fibers, performing the seated calf raise builds your endurance required for running, cycling, and walking. It stimulates the growth of muscle and bone tissue, which helps in preventing injuries to your ankle and tear along the shinbone (shin splints). 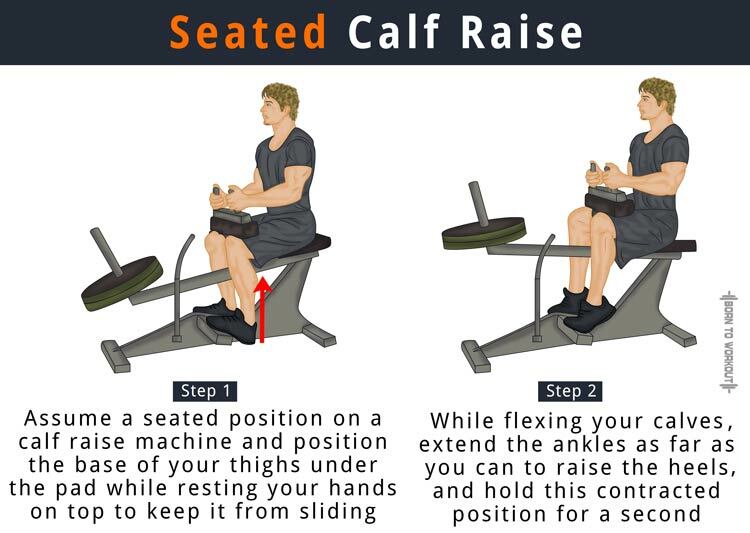 Assume a seated position on a calf raise machine and place the toes on the platform provided so that your heels naturally extend off. Make sure that your toes point forward. Adjust the height of the lever pad so that it is on par with that of your thighs. Position the base of your thighs under the pad while resting your hands on top to keep it from sliding. Push your heels up to raise the lever, and let go of the safety bar. It is your starting position. Bend at the ankles to gradually lower your heels. Be sure to stretch the calves fully while performing this movement. While flexing your calves, extend the ankles as far as you can to raise the heels. Hold this contracted position for a second. Do the desired number of reps by repeating the above steps. For this exercise, you will need a flat bench, a step or block, and a barbell. Place the block about a foot in front of the flat bench. Assume a seated position on the bench, with the ball of the feet placed on the block. Ask someone to place the barbell on your thighs. Hold the weight at about 3-4 inches above the knees. It is the initial position. 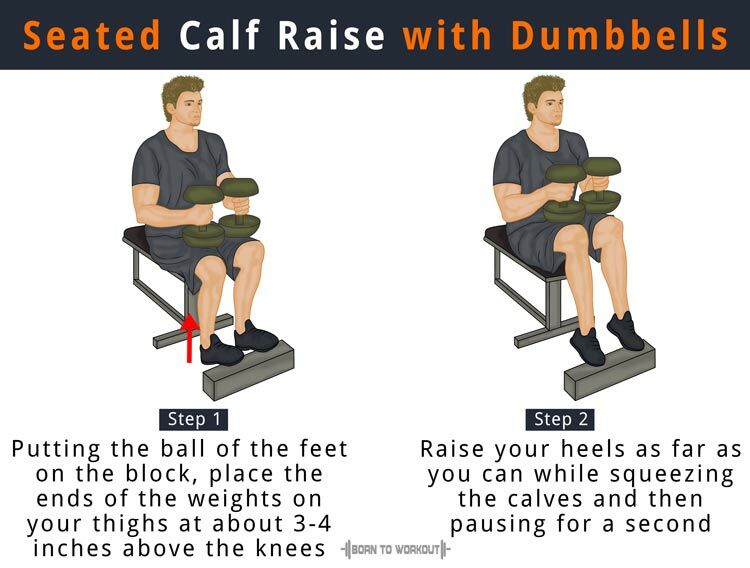 Lift your toes as far as you can while squeezing the calves. After the second contraction, gradually return to the initial position. Be sure to stretch the calves fully to get the maximum benefit. Perform the desired number of reps by repeating the steps. 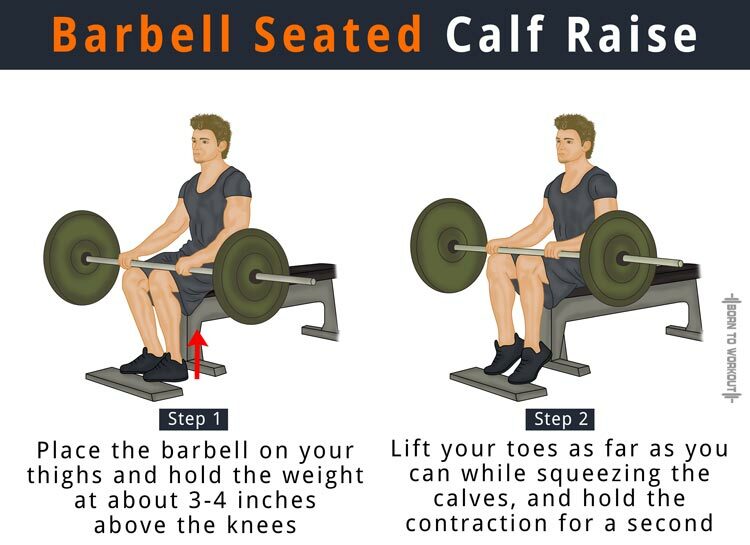 Do this exercise the same way as the barbell seated calf raise, but by replacing the barbell with two dumbbells on your thighs. If you have dumbbells at home, you do not always have to go the gym to do this exercise. Do the reps in a controlled way and limit momentum at the top of the movement. Avoid lifting the heels too far up if you feel the bottom of your feet excessively stretched.